lots of laughter and an appreciation for each other. World Y.W.C.A. and a Member of the Order of Canada. and a tender dignity. I will miss her. What a lovely tribute to your friend! I LOVE this painting. It reminds me of an Alice Neel work - gets right to the soul of the subject. I'm sorry you lost your friend, Ann. It sounds like she lived an amazing and wonderful life, full of meaningful things.The portrait looks pensive and thoughtful. great job. My condolences, Barbara. Your painting of your friend is really special! Your friend while unassuming made a big contribution to others in her life - your tribute to her is very moving and the portrait is amazing. Thank you so much. What a kind compliment. It is a very good likeness. In fact I was staring at the photo the other day and remembering the silk shirt, her expression, her eyes and her hands. I'm delighted that you see her soul too. That is wonderful. and will be horribly missed. Thanks for your support Sally. Thanks for this. My friends' Mother and mother-in-law was a very special person. I am so glad I got the chance to know her, and had the honour of doing her portrait. Thanks so much. I feel for David and Suzanne and Ann's extended and loving family. She will be missed terribly. David and Suzanne were devoted to Ann. They spent many Sundays having family dinners with her and her husband Bruce. So they will miss her terribly. I was happy looking at the photo to see that even though the painting has my style it is an accurate portrayal of Ann, of her appearance and expression. I was filled with memories of our portrait sessions together. And she and Bruce have come out to our shows. I will miss her. Barbara, I'm late leaving a note, but have been thinking of you ever since I saw this post the other day. I'm so sorry for your loss. This portrait is a treasure. 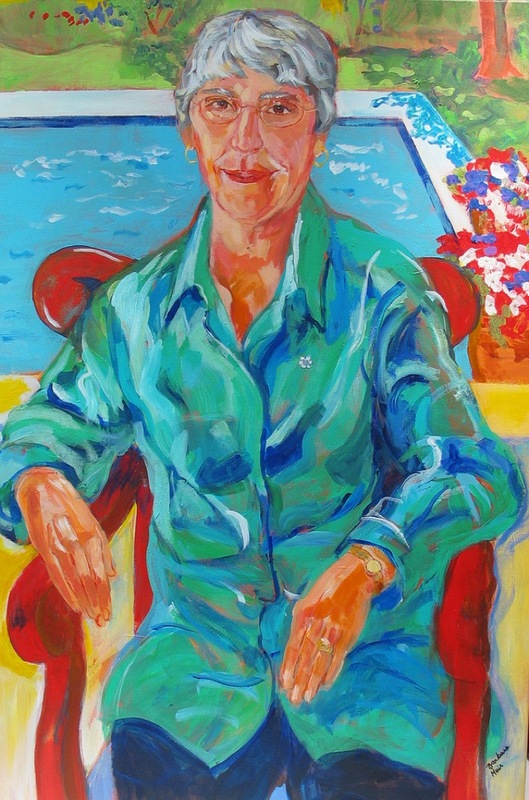 Ann's image remains documented for those that loved her in bright, joyous Barbara Muir colour. We should all be so lucky! Dear Barbara, I am sorry to comment here so late, but unfortunately I missed this post and only now had the time to stroll through your blog again. My sympathies to you. Your painting is a lovely, I agree with what the others have already said above. Have a wonderful Sunday! The lucky person was me to have the honour of painting someone who'd made such a contribution to the country, and to women. She was a woman of strong moral beliefs who had taken action to improve the lives of many. I found her inspiring, and fun to be around. Thanks so much. My thoughts are with David and Suzanne. Ann was a strong woman who loved her family, and loved having her family around her. Each holiday, or birthday was an occasion for a big family party. Her sudden death was a shock, and she will be terribly missed. You are so nice painter. This is so nice painting she lived an amazing and wonderful life, what a lovely tribute to your friend! David and Suzanne were devoted to Ann. Thanks for this. I am very impressive you're blog. Thank you so much. David and Suzanne were devoted to Ann. And she to them.